Last time we looked at the I2C Sensors that are part of the weather station. At the end of the article it was noted that these were working and able to log data to the Particle ecosystem. The Ultraviolet light and wind direction sensor will present us with a problem as they are both analog sensors and the Oak only has one Analog-to-Digital Convertor (ADC). 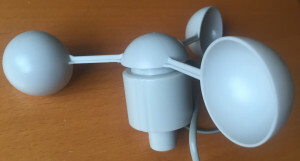 The rainfall gauge and the wind speed sensor both use a similar technology to generate a signal, namely a magnet that will trigger a reed switch. These two sensors also present an issue; while they are simple enough there are a finite number of pins on the Oak and they are being consumed at a fair rate. The chart above is generated when the supply voltage is 3.0V but the system under development will be using a 3.3V supply. Some investigation is required to determine the output voltage when there is no UV present. After running the sensor under constant temperature conditions with no UV light present the ADC was generating a reading in the 316 – 320 range. This gives out output voltage for the sensor in the range 1.02V – 1.03V. 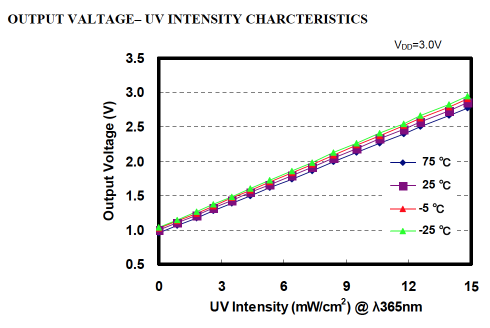 If we assume that the output characteristics of the sensor remain linear at 3.3V and the gradient remains the same then we can generate a formula for calculating the intensity of the UV light based upon the sensor output. If we set x to 0 then the equation becomes y = c This represents the output of the sensor when there is no UV light present. As we have seen from the above experiment, this is in the range 1.02V – 1.03V. So as an approximation we will use the value c = 1.025V. 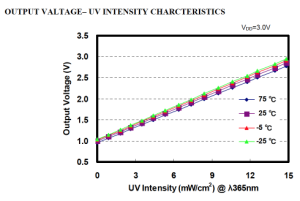 There are some assumptions in the above work and the data sheet shows that the output voltage can vary but we have a method for calculating the intensity of UV light; accurate enough for a home project anyway. This has a magnet on the spindle connected to the cups. The magnet closes (and opens) a reed switch each time it passes the switch. So one pulse is generated per full revolution of the spindle. Each full revolution of the spindle (per second) represents a wind speed of 1.492 miles per hour (mph) or 2.4 km/h. For the experienced, this sounds simple but we all know there could be a nasty shock in store for us, namely switch bounce. 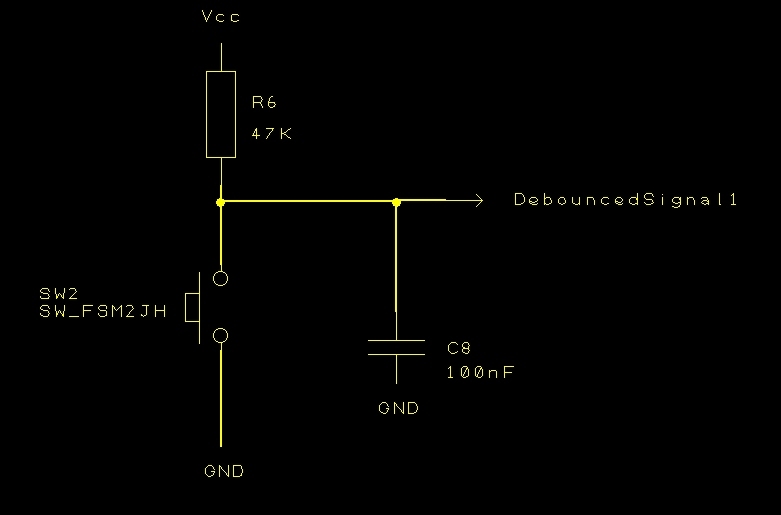 An easy way to find out, hook the output up to an oscilloscope. The circuit is simple enough, connect one switch contact to 3.3V, one to a resistor and the other end of the resistor to ground. Connect the scope to the resistor / switch junction. 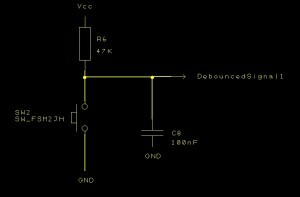 The principle is that the RC circuit resists change and so filters out the glitch in the above trace. So we need a filter that is resistive enough to filter out the glitch but fast enough to respond in the minimum time between pulses. The weather station is going to be located in the mainland UK, about 30 miles from the coast. In this location the wind speed is unlikely to rise above 60-80 mph unless in extreme conditions (tornadoes are known to occur in the UK). 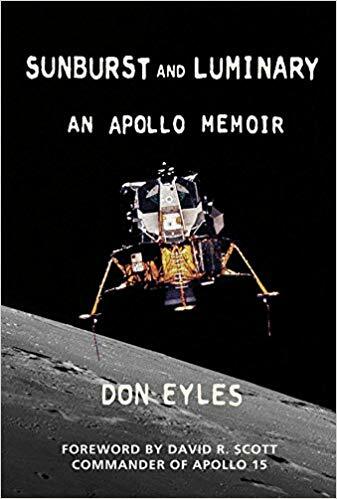 So assuming the maximum wind speed in 149.2 mph (this number is based upon the fact that 1.492 mph gives one revolution per second) then we have a maximum number of rotations of 100 per second. This gives a revolution time of 10 milliseconds. The signal appears to be high for 30% of the time. An accurate measurement could be made using the scope but it does not appear to be necessary. In our case, 10 milliseconds per rotation, the signal would be low for approximately 70% of the time, i.e. 7 milliseconds. There are plenty of online calculators for this type of circuit, Layada has one here that covers this type of scenario. We know the supply voltage (3.3V) and the trigger voltage (2.3V) so the only thing to do is look at the components available and calculate the delay time. After a few tries a 10K resistor and a 100nF capacitor were found to give a delay of 1.1939 milliseconds. This covers our case with plenty of margin for error. The rise time looks to be acceptable, smooth and slow enough to iron out the glitches but fast enough to allow a 10 millisecond duration with a 30% duty cycle. At the start of the article it was noted that four analog sensors are present in the kit. This article has concentrated on just two, the UV and Wind Speed sensors. The Rainfall and Wind Direction sensors will be covered in future articles. The two sensors here will require one digital pin and one analog pin. As there is only one analog pin on the Oak then some creative thinking will be required in order to connect the Wind Direction sensor. Saturday, April 2nd, 2016 at 10:41 am • Electronics, ESP8266, Internet of Things • RSS 2.0 feed Both comments and pings are currently closed.